In sort, if you say you can’t do something then you won’t try and you are dooming yourself to failure. 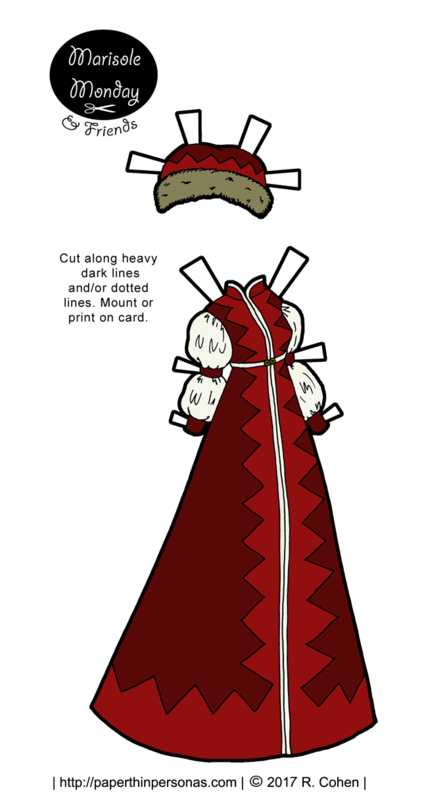 One of my long standing “can’t” do things has been drawing 1880s bustle skirts. I’ve told myself I can’t draw a bustle skirt so many times, that I’ve convinced myself this is true. 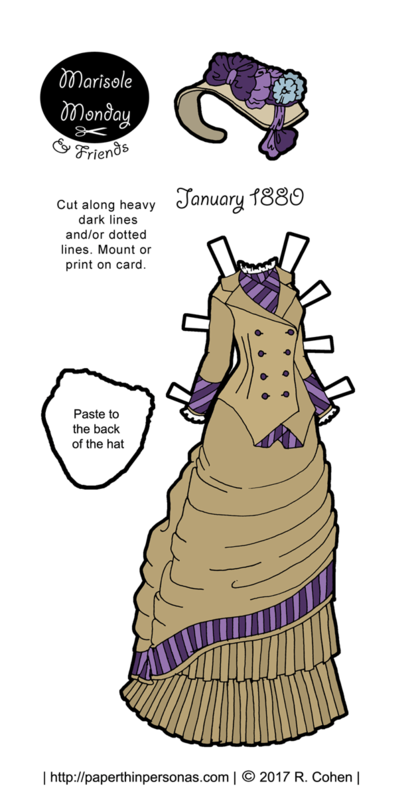 But I decided I was going to face my fear of 1880s bustle skirts by actually drawing one. Step 1 was finding a fashion plate at the same angle as the paper doll to practice with. After a bit of hunting, I found this plate from 1880. Next step was doing a draft on cheap lined paper and then doing a final on my nice sketchbook paper. I’m actually very pleased how it came out. I might even try another one or two, but I have to find another fashion plate at just the right angle. Not having to rotate something in my head really makes drawing it easier. I have been thinking about trying the dress on the left of this plate, but rotating the plate before I print it so it is facing the right direction for Marisole Monday lady paper dolls. I prefer to draw from printed images rather than digital ones. So, how did I do? Should I work on more 1880s stuff? Or is this a period that you’re not to keen on? Let me know in a comment. Want to see sketchbook drafts of this dress? There’s up on Patreon. Join to check it out! And, you know, help keep the blog on the interwebs. If I had to pick a favorite period of fashion history, I’m not sure I could. I love the 18th century, the 1920s, 1960s, the Regency, the 1300s… I could go on and on, clearly. However, if I had to pick a favorite era of the Victorian period, then the bustles absolutely win. I love them all. I love the soft draped bustle of the early 1870s, the narrow skirted bustle of the early 1880s and the tea-tray supporting bustle of the late 1880s. I don’t care how absurd they look. I just think they are so much darn fun. 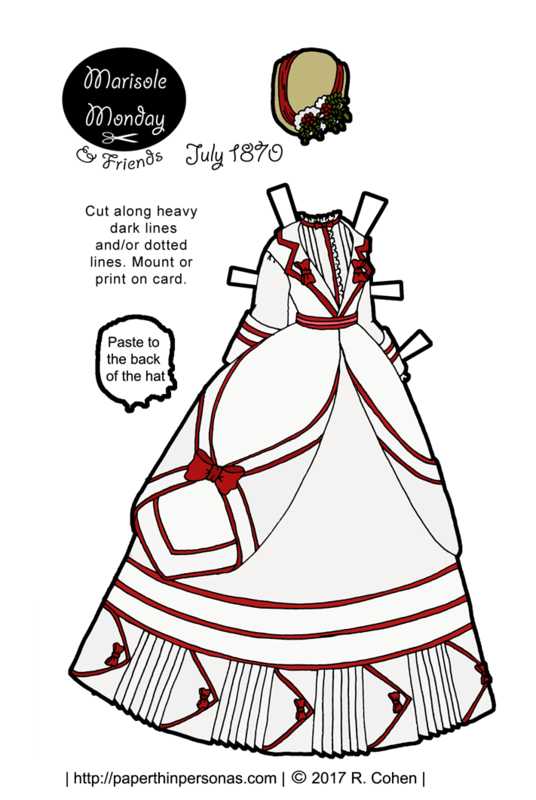 Despite that, I have drawn very few paper dolls with dresses from 1870. I think the reason is that I’ve also been intimidated by the bustle. So many loops of fabric. So much drapery. The angle has to be just right to show off the fit. 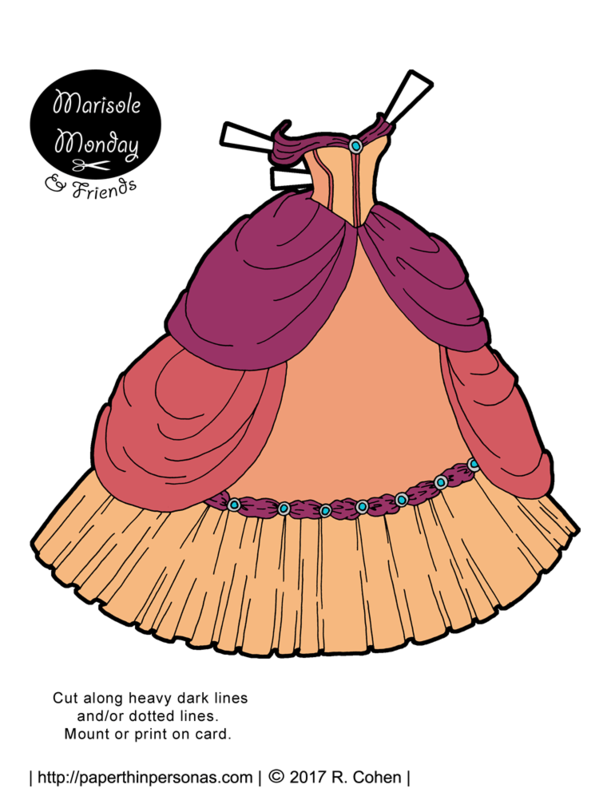 But I decided to try it this time, so here she is- a dress from 1870 for Marisole Monday & Her Friends. Just the ladies. This won’t fit the gents. It is based off this dress from 1870 published in The Queen, the Ladies’ Newspaper in January. Queen was an English fashion magazine that published French fashion plates and started in 1861. In 1968, it was purchased by Harpers Bazaar. Until 2006, in England anyway, Harper’s Bazaar was published as Harpers & Queen. I’ve yet to find a good online archive of The Queen, the Ladies’ Newspaper full-text, but if anyone locates one let me know. Their fashion plates are lovely. Without the accompanying information, it is hard to know what exactly this dress was intended for. Based on the style, I am thinking a seaside nautical thing. January magazines often published the first Spring plates, so I suspect this is a Springtime outfit. Oh, and there’s a patron only blue version, too. Join to check it out! And, you know, help keep the blog on the interwebs. I gotta confess this has been a wide ranging week for printable paper doll themes. We’ve gone from Monday aliens to Tuesday Little Bo Peep and now we’ve got some cocktail dresses. Well, it can never be said that I don’t have a lot of variety and diversity in my little paper doll populated corner of the interwebs. I love fashion magazines. My favorites to draw from are People Style Watch and Instyle. Both of these magazines are pretty easy read and you can see the images of the clothing well. After all, I might not ever buy a 600 dollar blouse, but I like to see it clearly for drawing purposes. I have noticed I draw a lot less modern stuff now that I have the new format. Not really sure why that is, but there you go. Anyway, this fall there was a whole pastel cocktail dresses for wintertime thing going in the fashion magazines I read. So, I wanted to create a pair of pastel winter paper doll cocktail dresses for holiday parties. Now, I realize it is February and most holiday parties are past, so maybe a Valentine’s Day date night option? Yeah, I kinda missed the boat on when to post this pair of dresses, but that happens to me on occasion. No shame. I am curious though. Do people miss modern paper doll clothing? Would you like to see more of that? Let me know in a comment. I’m also super pleased to announce that there is now a Paper Thin Personas Etsy Store! You might have noticed the addition of the Shop tab at the top of the page a few days ago. I had fantasized about doing some big perfect announcement, but you know what? Done is better than perfect, so I am releasing the store into the wild today. Plus, remember that becoming a patron has some great benefits and helps cover the blogs costs each month. So, I work in batches. This doesn’t just mean I tend to draw a batch of the same paper doll series together, it also means I sometimes draw the same themes together. 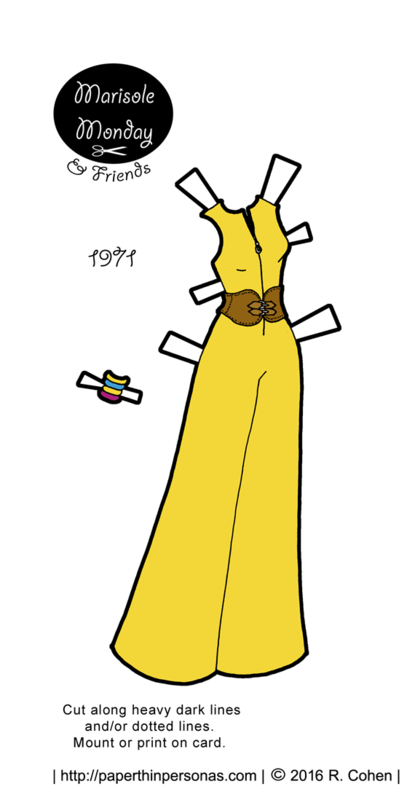 For example, I drew today’s jumpsuit around the same time I drew the my 1970s Mini-Maiden. Sometimes, I get into a theme, like 1970s clothing, and want to spend some time there. Then I promptly get over and am distracted by some other thing. That’s the nature of my brain. Today’s jumpsuit was based on a 1971 Simplicity sewing pattern cover. Apparently the pattern was designed to be sewn quickly and only took two different pattern pieces. I loved the cheery bright yellow color in the cover art, so I kept it. The wide brown belt was from the pattern cover, but it also was nice because it split up the jumpsuit. I think jumpsuits really need belts, don’t you? This is probably the last piece of 1970s clothing for the paper dolls for a while. 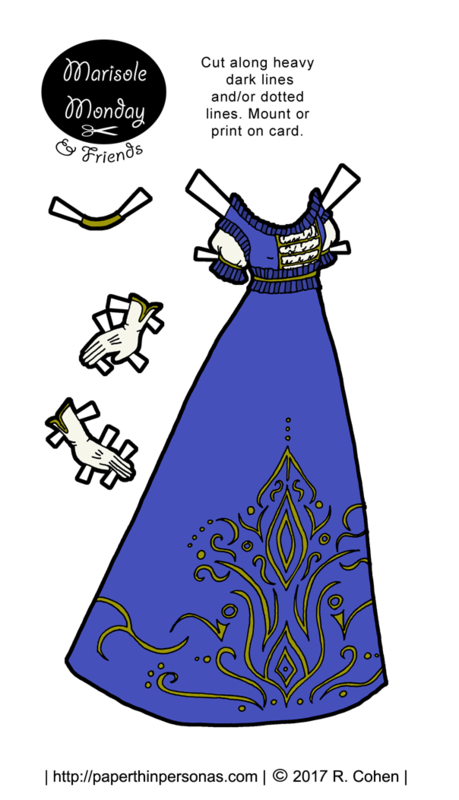 As I said above, I tend to be a bit flighty in my paper doll interests. I have been feeling very “over the top princess gowns” lately, so stay tuned for some of that, also I have been dabbling in the 1870s. Out of the curiosity, which do you like better for the fashion- the 1970s, the 1870s or the 1770s? I have so confess to being a pretty big 1870s fan. Let me know your favorite in a comment. And think about becoming a patron if you like the blog to help support it, or check out the blog’s new facebook page. I’ll be using it to showcase some of the archives content, plus other stuff I think is cool.